Hey Siri. If you have one of the newest iPhones (6S or 6S Plus), you can set up Hey Siri. This pulls up Siri without having to touch your phone. It's so handy in the car and any time your hands are full. I've used it loads of times to set a timer while cooking. Just go to Settings, Genera, and then Siri. Switch Hey Siri to ON, then tap to set it up. I believe that iPhone 6 can do this too, but the phone has to plugged in for it to work. Remember "this". If you are looking at any content on your phone inside an app, just pull up Siri and say: remind me of this. Siri will put it in your reminder app that will not only link to the app you were in but also to the content you were looking at. Math!! 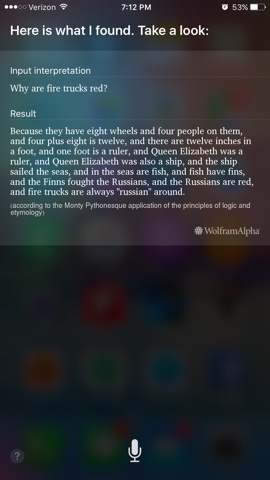 Siri can help you with basic mathematical equations as well as unit conversions. You can even ask Siri what to tip on your total bill. Soooooo handy!! Especially for someone like me who is not best friends with math. All the Music!! Siri is fully integrated with apple music. You can ask Siri to play any song or songs by any artist. You can have Siri shuffle your music, access your stations, or even lists of top songs from any musical era. The possibilities are endless. All you have to do is ask! Settings and Apps. You can have Siri open pretty much any app by just saying "open (insert app name here)." Siri can also set alarms and timers just by asking. Siri also can turn your settings, such as airplane mode, wifi, bluetooth, and do not disturb on and off. Really quick and easy. Shopping Lists. Siri is a super fast and easy way to add items to any reminder list. For instance, I have a shopping list and to add anything to the list I just say "add (insert shopping item here) to Shopping List." So freaking handy. I also have one list called To Do. Super easy to add items to that reminder list too! Just set it up in your reminders app and then Siri has access to it. BONUS!!! Ask Siri: What does the fox say? You're welcome. Hopefully this list will help make your iPhone an efficient life tool as well as a fun device!